Veena also spelled 'vina', is a plucked stringed instrument used mostly in Carnatic Indian classical music. There are several variations of the veena, which in its South Indian form is a member of the lute family. 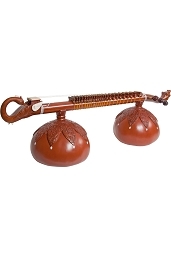 One who plays the veena is referred to as a vainika. The design of the veena has evolved over the years, probably from the form seen in South Indian Medieval paintings and temple sculpture: a string instrument with two gourd resonators connected by a central shaft, possibly of bamboo, and held diagonally from lap to shoulder. Veena in South India developing from Kinnari Veena in the 1600s was initially known as Tanjori Veena after hereditary makers from Thanjavur but was later called Saraswati veena. 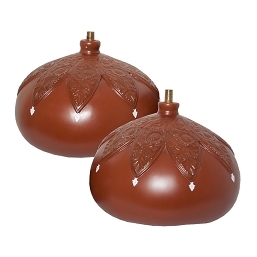 Made in several regions in South India, those made by makers from Thanjavur in the South Indian state of Tamil Nadu are to date considered the most sophisticated. Sangeet Ratnakar calls it Ektantri Veena and gives the method for its construction. The North Indian rudra veena and vichitra veena, technically zithers, demonstrate this genealogy. Descendents of Tansen reserved Rudra Veena for family and out of reverence began calling it Saraswati Veena.